I’m a Web pioneer who believes that technology and the Internet can transform our lives in powerful ways, but only if we are thoughtful about what we use and how we use it. I travel around the world speaking about issues surrounding business, new technologies, the Internet, social media, mobile and often in the context of women’s issues. I keynoted Type A Mom Conference (Looking Back, Looking Forward: Women’s Journeys on the Web); keynoted SheCon in Miami (Smart Ways to Use Future Tech); and led an interactive workshop at Blogworld to empower women to pitch to speak at tech conferences (Speak Up: Empowering Women to Find Their Voices) with Jill Foster of Live Your Talk. Find out where I’m appearing next. I’m also the author of 11 books to date. My current company is a digital consultancy with a passionate focus on social and mobile integration, Mediaegg. I work with companies and organizations to develop cohesive, integrated marketing strategies. I am also a brand evangelist for the products and services that I genuinely love and use. And yes, I am sometimes paid to align my own brand with someone else’s brand, and I’m careful to disclose when I’m working with a company versus just being a fangirl. I’m also a co-owner of Conversify, an early social media marketing agency. I contribute to various blogs but most often to Web Worker Daily, Mashable and Entrepreneur Mom. One of my personal projects years back was called Chain of Daisies, a community and resource to help more women get higher-level, paid speaking engagements at business, tech and venture conferences and to help conferences looking to diversify their speaker lineup to tap into a pipeline of qualified, dynamic female speakers. 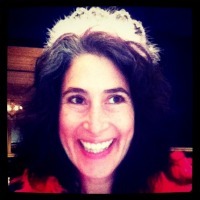 And yes, I do wear a pink tiara and boa at conferences. Here’s why.